I am going to be a part of the first ever National Food Bloggers Bake Sale, which is part of the Great American Bake Sale. We are raising money for Share Our Strength (SOS), a national organization fighting to end childhood hunger in the United States. 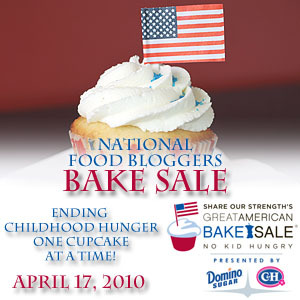 Food bloggers from across the country will unite to support the cause by holding bake sales in their states. These bake sales will give loyal readers the opportunity to taste the baked goods from their favorite food blogs and introduce others to the treats featured on these great blogs, all while supporting Share Our Strength in their fight to end childhood hunger in the United States. Pennsylvania is going to be having THREE bake sales, one in the Pittsburgh area, one in Hershey, and one here in Philadelphia. I am organizing the Philadelphia location and Jen, from My Kitchen Addiction, is organizing the Hershey location. If you live in Pennsylvania we hope you will come out and help us raise money for SOS. More location details will be coming in a post in a near future. If you are a Philly food blogger and would like to help, please leave a comment and we will be in touch with you! If you would like to get involved in your state, click here to find out who to contact. If you live in Pennsylvania, mark your calendars for April 17th! Come out and taste some of your favorite food bloggers tasty treats! How does the bake sale work? Do you accept donations of baked goods from local companies or just food bloggers? We do accept baked goods from local companies. If you are interested in more information I can send you an email. I’m a Philly food blogger and I’m interested in baking for the sale!